Kilncasting is the process of creating a glass object in a kiln by heating glass above or inside a refractory mold until it flows to fill the void. One of the biggest challenges in kilncasting is creating the mold. There are two types of molds that can be used in kilncasting: open-faced or closed/semi-closed. When using an open-faced mold, your finished piece will be a reverse-relief, bas-relief pâte de verre, thick-block, or box castings. 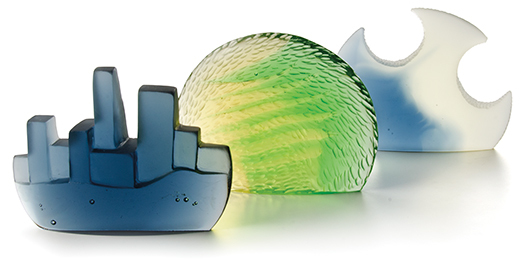 When using closed or semi-closed molds, you will be able to make full sculptural pieces. How can I learn to kilncast glass? What firing schedule should I use for kilncasting? What equipment will I need for kilncasting?